Herald: The Panjim by-poll is closed, with the fate of candidates sealed in the ballot boxes. Against the backdrop of what has happened in Delhi, do you think Goa is in a position to look beyond the main national parties and beyond Manohar Parrikar, irrespective of what the Panjim by-election bring forth. Vijai: People in Delhi are tired of rhetoric. In our State capital, I don’t think people are less tired. It is a fact that the BJP faction from Margao used to taunt the then chief minister that in his entire term he could not solve most of the pressing and most urgent public issues like parking, etc. Now take Panjim, which had an MLA for almost 20 years and who was sworn in thrice as chief minister, but the St Inez creek has been the most polluted, while the chief minister has only been crunching numbers. Development has been cosmetic, besides Inox (multiplex) and a few footpaths, but he hasn’t solved the garbage problem, inspite of boasting of his IIT. So politics of Goa without Parrikar is I think a choice which the BJP has done at the national level. They themselves have taken him out of Goa. No one is indispensable. Goa is ready without Parrikar. 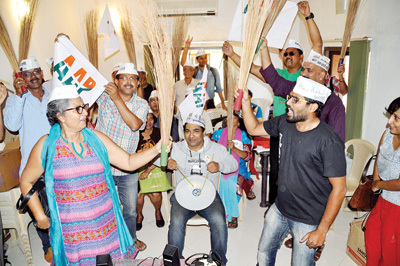 May be people of Panjim could have shown the way how they could replicate the AAP formula in Goa. Timble: I don’t think that AAP’s Delhi success would have an impact of the Panjim by-poll. It is true that the candidate who was foisted on the Panjim electorate was a little unfair, the BJP candidate. But still this candidate will win. For the simple reason that BJP workers will not work against their candidate. The equation in Delhi was different where BJP voted against their candidate as they wanted to send a strong message to the Modi-Amit Shah faction of BJP. Superficially if you look at the equation in Goa, one feels there is no alternative to the BJP. But if you qualitatively analyse, there is definitively an alternative to BJP and there is scope for a very good regional front, if it can emerge, call a new political combination. Herald: Don’t you think it is interesting that a party which comes to power with an absolute majority loses so much of ground in two and a half years. They are projecting everything is fine, that projects are taking place, but this kind of a change of mood is difficult to fathom. Vijai: The change of mood within the electorate is proportionate to the number of U-turns done by the BJP. They have done a patent on U-turns. He banked on the discontentment with the Congress regime and based on that, gave sweeping promises only to go back on those later. There was a complete betrayal of the people. This betrayal was not felt in only Salcete. It was felt all around. Every section of the people have felt cheated and betrayed. People of Goa are now seeking a change. However, despite this series of U-turns, the Congress has failed to emerge as an alternative. The Congress which has been reduced to a single digit, have failed to reconcile and accept the reasons why it was dumped. Otherwise where is the young leadership which they are talking about? What is the guarantee that young leadership will emerge in the next two years? Timble: Where do we find Congress in Goa? In Goa we find only senior leaders who say they are Congressmen. You don’t find Congress party as such. Herald: Speaking of BJP, the party image has been on a decline since it assumed power this time. Doesn’t the BJP has an intrinsic strength to recover from what it failed to do and deliver on promises? Or are we saying that without Parrikar the BJP is even incapable of trotting or crawling? Is the BJP so weak without Parrikar? Timble:I feel the BJP is a very strong organization. As a government it is the weakest organization. Party-wise they have a cadre, they are very vociferous and active. Governance-wise they fall short. Parrikar created that image, but if you look on the ground there is no delivery. Vijai: I feel Parrikar’s leaving Goa, has helped the BJP to create more U-turns. They can just disown him. Look at the casino licence renewal issue –Chief Minster Laxmikant Parsekar disowned what Parrikar promised. Perhaps he has been tutored to say this by Parrikar himself. For the simple reason, that Parrikar has made double U-turns, meaning U-turn on a U-turn. Since they have an absolute majority in the House, they know that the Opposition is not in a position to challenge them seriously in the House. They have a governor who swears by Modi. But all said and done, beyond another two years, it will be very difficult for them to face the electorate. They can only face the electorate in the absence of a tangible Opposition. They are now trying to divide families, by contesting zilla panchayat elections on party lines. The formula of winning elections by creating riot-like situations have failed in other states. People cannot be fooled all the time. The U-turns and betrayals done by the BJP during their regime cannot be erased from the minds of the people. Herald: Assume that BJP wins the Panjim by-poll, they may see this little success as a referendum of Parrikar’s popularity and ride this wave in the zilla panchayat elections. Timble:They are sure to win. However, their cadre is not happy with the candidate. Voters will not desert them this time. There is panic in their mind. Herald: Coming to the Congress, it’s true that there is not much of a party there, despite their efforts. Goa as a State and its voters has changed a little bit. Traditional voter who were aligned to a political party or candidate in a true sense is changing. The new generation has seen a new trend. This generation is looking beyond the zilla, taluka or the village. There is a sizeable electorate which falls in such a category….could be even 15 per cent. This can be a game-changer. May be the BJP or Congres are not in sync with this new reality of the Goan populace. Timble: In think the BJP understood the reality of the Goan populace when it went to polls last time around. Plus, the problems of the Congress helped in giving BJP, the edge. However, the parties have to reinvent themselves. Otherwise there would certainly be a vacuum. The Congress ideology on India is not wrong, the thinking on inclusive development is not wrong. For them to fight against corruption would be an uphill task. If Congress wants to approach the next elections, they have to reinvent with issues like protecting land resources of Goa, transparency in government, etc. Vijai:Congress operates on the basis of High Command. There is a huge disconnect between the High Command and the ‘Low Command’. Tickets are said to be sold. Illogical decisions are being pushed down the throat of Goans saying there is no other alternative. In the previous elections, the minorities of Goa have taught Congress a lesson. Coming to the point of fighting corruption, how can a party which is in a joint venture with the government on major scams that have plagued Goa, fight against corruption? You have a Special Economic Zone, where BJP wants to give back land to promoters. The SEZ scam was done by the same government. How are they going to talk? There is a case filed in the Panjim police station by Manohar Parrikar on this. The complainant has now become a partner in crime. How are they going to speak? A vacuum is naturally created for a new political combination. And if nothing emerges in such a scenario, then we are politically impotent. Herald: Talking about age group and the new generation, BJP MLAs are not old. Is it all about young people or is it about people who are in sync with the electorate? Timble: You have to bring younger people. India has got dividends from the youth. Senior people have to phase out and perhaps take the role of counsellors. Herald: If you are contesting in Panjim what would be your ideal manifesto be? Vijai: I would never jot down a manifesto without visiting every nook and corner of the constituency. You need to go there and listen and then come out with a white paper. How does the capital city of the State not have a garbage treatment facility? This challenges every possible logic. And are you talking about a smart city? What’s this smartness. Can a city be smart which is dirty. There should be tangible soloutions to problems. Herald: Where do we go from here, considering the 2017 polls are not too far? May be sooner than 2017. Congress has got nothing to lose. BJP has everything to lose. For the people, there is everything to gain. Do you think change is really possible or are we dreaming? Vijai:Why is it not possible, when it was possible to elect five independents? People will be more open to change as they are tired of these U-turns. That is why Parrikar went to canvass in every house in Panjim. The entire world knows that this election is fixed. If we don’t come up with an alternative to tackle this, we are betraying the people of Goa. People like me will not have a face to go to the public next time. We cannot go to the people as Independents twice. I have to have some label. Some tag attached. Why should people vote for an independent twice? Timble: According to feedback, Parrikar had to visit houses because people were confused whether to actually vote for the person, because the candidate has been imposed on them. At the same time there was Parrikar who may have done work for Goa, but for them he has not done anything. But then they didn’t want to go back to the Congress. For an alternative to take shape, it requires work on the streets. It cannot be done by press releases and press conferences, neither through an arm chair campaign. You can’t start regional politics suddenly. It’s a gradual process. Herald: Could you clarify who are ‘you’ and who are the ‘we’? Vijai:People have dealt with big issues in the past --from Opinion Poll to Mother Tongue. It is the role of the Fourth Estate to come into play when the other pillars of democracy are slipping. The onus is on us definitely to take the initiative. Collective leadership counts. We may have to create a common minimum programme. It is proven that Microsoft, no matter how popular they are, can’t get you elected. Today a 10-lakh suit can’t win you an election. You see how the muffler-man won. Herald: If you look at majority of the States, every State is ruled by a regional party chief minister. If you look at Trinamool party in W Bengal, look at Odisha led by Janata Dal, in Bihar it is JD(U), in Telangana, its absolutely regional --Chandrababu Naidu’s is a regional party. Coming to the south AIADMK is again a regional party, so is DMK. All through the country, especially in small States, it’s the regional parties, but not in Goa. Timble:We have MGP which is a regional party, but sadly eaten away by the national party (BJP). Vijai: The biggest pitfall of our regional parties is that over time they have got tired and merged themselves with national parties. These parties talk about money and funding for the party. Now why can’t we run a political party with the money of common people of Goans, on the lines of AAP? Timble: I am not sure about coroporate funding for AAP in Delhi. Their funding is transparent. You can go online and check their funding. In elections, it is extravagant spending. AAP is a model of political cost minimization and maximizing yield. You don’t maximize costs. Herald: What kind of polity do we really need? What kind of a party? What kind of a formation are we looking at? Are we saying you should create a party? Or are we saying, firstly, you need to have the core base of people who’ll form this whole movement? Core base includes a spectrum of people across various sections. The question is --is this class of people willing to do this? Where will the money come from? Should this be a mix of people including established politicians? Or should it be absolutely apolitical?. What are we working with? Timble:There is no such thing as absolutely non-political. When we are talking politics and saying that it should be non-political, doesn’t it make sense? Established politicians, and even politicians who are part of other parties can be a part of this formation, provided the public image is with the alternative that we are giving. Their public image should be that they are non corrupt, that they are transparent. And they should stand up for the values for what Goa and India stands for. Then there is no issue at all. Herald: Goa has an array of activists, right thinking people, lawyers, etc. They are wonderful people. There is lot of discussion happening, but on the ground nothing changes, because nobody is ready to take the plunge. Everyone seems to be happy in their own businesses, in their own professions. Can these corner discussions take shape? Can something concrete happen on the ground? Vijai: Somebody will have to take an initiative to reach out to everyone. Responsible and courageous journalists also will have to support such an endeavour in the interest of the State. We are at the risk of losing our identity. Goa today is not what it was. It is degenerating into something else, which is just an extension of Delhi. We are losing our entire countryside, which Goa was known for. Suddenly, the word Indo-Portuguese appears to have become a bad word. One has to decide what is Goa. We have a different history from the rest of the country. That’s why people come here. The Delhiite has always been the transgressor. The High Command culture. Goans are opposing such high command culture. Copying AAP model in Goa may backfire. The topi culture may be accepted in Delhi, but may not hold good in Goa. Timble:People have to move with people. It becomes a movement and then it takes political shape. It takes around two and a half to three years. We can’t fast track that change. We have to work with like-minded people. Even if a regional party doesn’t succeed in ruling ,then we at least require a very strong Opposition led by a regional party, keeping local issues at heart. Vijai:We have to work with youth. Especially the Hindu youth, because they know that they can’t be taken for granted. We can activate a regional force with enough of follies of the BJP government. Everything stands exposed. Herald: Panjim by-poll has come and gone, but the time has surely come to look at the future of Goa in a totally different way. There has been a huge shifting of goalposts as far as people to political relationship is concerned. A different kind of polity is required. The idea is that ultimately it is we need to be the change that we seek and if that is the case, then words needs to be converted into action.